We’ll take a load off. Moving is great once you’re in but getting there is about as pain free as a full body wax. But we can make moving your energy supply painless. Even if your new place is disconnected, we’ll get it switched on free of charge. You’re welcome. 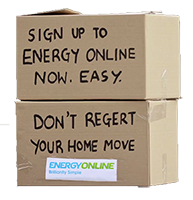 If you're already an Energy Online customer, then keeping your energy supply connected with Energy Online while moving house is quicker and easier than your first kiss. Make the move online or call us on 0800 086 400 and we’ll make the move with you. As well as a 20% discount when you pay your electricity or natural gas bill on time and in full. If you want to move, you can. No regrets. Arrange your home move or switch online in less than 5 minutes.